when i first heard this idea, i was ecstatic, no joke kids. i think this is an epic idea that will probably become standard with online nail polish retailers in the coming years. seriously, what's to lose? NOTHING. you buy a few spoons to find your perfect color, and even if you just buy one polish afterwards, you don't lose anything because the amount you spent on the spoons goes toward paying for it! genius. 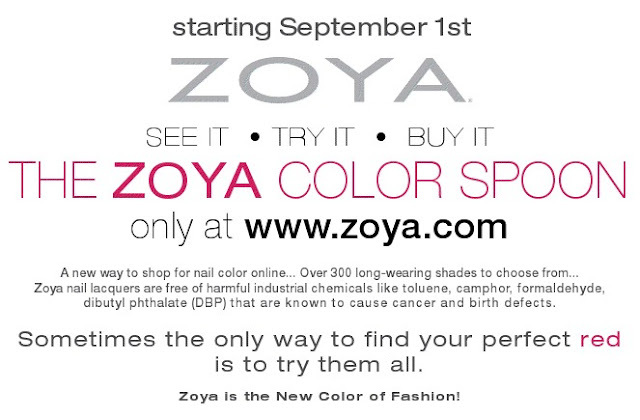 if you are are a careful shopper, are wary about buying polish online, or just want to make sure you are picking out colors that will be just as fantastic in real life as they look on your computer screen, i definitely recommend trying out this option at Zoya.com.